The CareerBuilder Super Bowl 2012 Ad has just been released on Youtube and brings back the controversial chimpanzees. As you might remember, Careerbuilder brought back the monkeys after a five year break last year. Animal right groups had protested, but CareerBuilder stuck with the monkeys (watch last year's Ad). The chimpanzees are for Careerbuilder what the talking babies are for ETrade. The just worked the best for Careerbuilder's Super Bowl ads. And that is the reason why the are back again this year. The CareerBuilder Super Bowl 2012 Ad shows a guy having to go on a business trip with the two chimpanzees. Nasty stuff happens of course. The ad is fun. 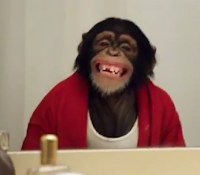 Especially the last scene is really played well by the chimpanzee in the red bathrobe. Watch the new CareerBuilder Super Bowl commercial below. CareerBuilder pulled the new Super Bowl Ad from Youtube for some reason. We found it again on Forbes. They seem to have an exclusive deal for now. Watch it below. Business Trip | CareerBuilder 2012 Big Game Commercial from CareerBuilder For Employers on Vimeo.